I’m so sorry that these didn’t turn out well for you, but at least you have some previously tested recipes to fall back on! My marshmallows were doomed, too. Maybe it wasn’t us, it was the recipe?!! Thanks for posting the eggless marshmallow recipe; I’m curious to try those next time! Boo! Sorry it didn’t go so hot for you – but at least you have a good go-to marshmallow recipe! Oh, blech. I’m going to try one of your eggless marshmallow recipes. On to the carrot cake! I agree that the eggs are totally unneeded! And when you add hot liquid directly to eggs how can you not cook and scramble them? ick. My normal marshmallow recipe doesn’t have eggs in it either. I ended up with a few bits of scrambled egg white here and there as well. Bummer that the recipe didn’t work out for you, but good on you for trying! I had never made them before, but I had seen other recipes that all looked much easier than this one…I’ll have to try one of the recipes you suggested! I am totally an anti-egg white marshmallow maker myself. I mean, I get the concept of using egg whites, all soft and fluffy and what not, but meh, too much hassle in my opinion. Plus, egg white marshmallows never stand up as well as non-egg ones when it comes to dipping in chocolate or floating in hot chocolate. And if those aren’t pretty much the major reasons for marshmallows existing, then I don’t know what they are. I go between the Thomas Keller/French Laundry Cookbook recipe and the Martha one. Definitely a big ‘A’ for effort, though! marshmallows are something i’ve always wanted to try making, but they feel like the end result is going to be more work than it’s worth. and i bought some ‘mallows at surfas last week, and for my $5, i didn’t even love them that much! So sorry they didn’t work for you. It’s a shame when you go through all that trouble with such high expectations and you’re disappointed. I’d be interested in making the egg-less version someday! Sorry they didn’t work out for you! I think I’m going to try the egg free recipe one of these days too. I totally agree, egg-less is the way to go! Next week’s recipe sounds good though! Sorry that the recipe didn’t turn out for you. At least you tried it out and kept on trucking to the end. 95 degrees in Southern California? My aunt has been complaining about the weather over there, but I didn’t know how bad it was. Is it just me or do these Dorie recipes sound horrible? i have tried without eggs recipes ,all sound good but every time they don’t set at all outside our temp in Lahore,pakistan r going 40 42 ‘ C .and high humidity. so i tried to set in fridge.still a disaster ! !were so goey they can’t be cut even a pinch.dont know what else wrong as recipes r so easy sounding.i dont have a candy thermemeter so use drop in water sugar syrup to check hard stage of caramel.here corn syrup is very expensive as imported and i have wastede thrice .any alternative to corn syrup.helllllppppppp.i want to perfect my recipe before my daughter’s 6th Bday in oct.as i intent to make marshmallow cut shapes for her cake decor.i have never had so much trouble with a recipe.have ing being baking almost 25+ yrs.though am a surgeon but this is my passion. Egg whites are unnecessary, but can work. 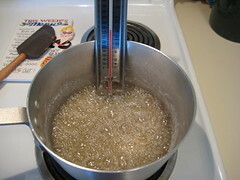 The sugar should NOT be cooked to such a high temp. You’re going for soft-ball stage, not hard. Try for between 235 and 240, but definitely don’t go over 240! I try to pull mine off at 238. Nighat, the temp is probably your biggest problem, although with the geletine, they should still set; it’s just that they’ll have a grainy texture after a day or so. You don’t say how long you’re giving them. The shortest I’ve seen is 4 hours, but a lot of recipes call for 12-24 hours of resting, so maybe you should give them more time. Also, I’ve seen agave nector substituted for corn syrup. Don’t go without some kind of syrup, though, or there’s a high risk the sugar crystallizing. Sorry about your disaster. So I thought let you know about my latest EggFree Baking recipe which I’m quite excited about. I have managed to successfully make egg free marshmallows. I’t all in the fluffy mixture that the hot jell mixture is beaten into. The fluffy mixture base is soy protein isolate which the commercial makers cleverly hide in their list of ingredients as contains soy. Follow the link below and then you, too, can enjoy making homemade marshmallows. I made these last night in hopes of getting yummy marshmallows (because I’m on a marshmallow kick right now) I made a few eggless recipes that, to my delight, worked soooooo well. I looked at these and was in love with the idea of cappuccino-flavored marshmallows. I guess its the thought that counts. I got the exact same result. I cut them after four hours of resting and thought that I cut them too soon because they were so…slimy! Ick! I left them out overnight uncovered and they were the exact same the next morning! I’ll stick with eggless, but I’ll find out a way to get that cappuccino flavor in there, because I tasted them and, though… texturally displeasing… they had good flavor. WHAT THE RECIPE FORGOT TO TELL YOU IS THAT IF YOUR USING EGGWHITES-YOU MUST USE CREAM OF TARTER. ITS A POWDER THAT HELPS THE EGGWHITES. ALL RECIPES FOR MARSHMALLOWS THAT HAVE EGG WHITES MUST HAVE CREAM OF TARTER. 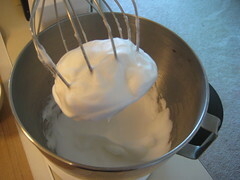 ANOTHER THING IS THIS-IF YOUR USING EGG WHITE METHOD YOU MUST USE A WIRE WISK FOR THE EGGWHITES TO GET FLUFFY. IF YOU DONT YOU WILL HAVE MOISTURE AND ALL ID DOOMED. THE WIRE WISK PUMPS AIR IN THE EGGWHITES. AND TRY USING PASTERISED EGGWHITES. THE HOT SYRUP KIND OF COOKS THE EGGWHITES WITHOUT SCRAMBLING THEM . ITS ALTHIA ROOT FROM THE HERBAL SHOP-NO MORE THAN 2$ FOR A SMALL BAG. ADD THE ROOT TO ALCOHOL 50/50 -THEN LET AGE FOR 2 OR 3 WEEKS. MAKE SIMPLE SYRUP -ADD THE EXTRACT BY 40%. 60% SIMPLE SYRUP-40 % EXTRACT. DONT NEED A PRESERVATIVE BECAUSE THE ALCOHOL IS THE PRESERVATIVE. YOU COULD ADD COLORING TO IT IF YOU WANT. MY SIMPLE SYRUP IS BROWN SUGAR AND WATER. SO DELICIOUS. I HAVE ADDED BLUE FOOD COLORING BECAUSE BLUE MAKES THE MARSHMALLOW SUPER WHITE-WHEN USING EGGWHITES. I wish I’d read your commentary before making these! I found this recipe through chowhound and was SO excited to try it that I got right to work. Mine set, but they are sooooo slimy and just… Ew. The texture is fantastic, but I think I prefer eggless marshmallows, too. I have only made marshmallows using a recipe like this one and they come out amazing! I think you have to be brave when slowly adding the hot sugar and gelatin mixute to the eggwhites, while beating at the same time and the eggwhites should already be whipped to a merigue when you do. Then you’ve got to whip it to a thick merigue again. I have not tried eggless yet, but they appear to be firmer and stickier.